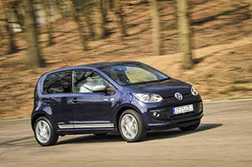 You will be training in a Vw up! This car is one of only a few training cars in Brighton to have achieved the maximum 5 star safety rating with ENCAP, the European vehicle safety assessment programme. It has a 900cc eco-friendly engine with a manual gearbox, air-conditioning, fully adjustable seat and steering wheel to ensure maximum driver comfort and a sun-roof for those sunny days!